In 1967, the City of San Francisco, California adopted Article 10 of the Planning Code, providing the city with the authority to designate and protect landmarks from inappropriate alterations. As of January 2014, the city has designated 265 structures or other properties as San Francisco Designated Landmarks. Many of the properties have also received recognition at the federal level by inclusion on the National Register of Historic Places or by designation as National Historic Landmarks. Completed in 1907, and survived the 1906 earthquake and fire. Since 1972, the City of San Francisco has designated thirteen local landmark districts ranging in size from a handful of buildings to several hundred properties. Landmark districts are regulated by Article 10 of the Planning Code. buildings erected in the 1850s to 1860s. collection in the Italianate style. 3 Northeast Waterfront Landmark District 9 Blocks, 52 Parcels 1983 Commercial and industrial district reflects waterfront storage and maritime activities, from the Gold Rush to World War II. 4 Alamo Square Landmark District 16 Blocks, 281 Parcels 1984 Residential district features richly ornamented houses in a range of Victorian- and Edwardian-era styles. 6 Telegraph Hill Landmark District 6 Blocks, 90 Parcels 1986 Eclectic hillside district features the largest concentration of pre-1870s buildings accessible only via narrow pedestrian-only lanes and staircases. 7 Blackstone Court Landmark District 1 Block, 4 Parcels 1987 Residential district centered around the now-filled Washerwoman’s Lagoon on a pre-Gold Rush trail of pre-1906 development in the Marina District. 8 South End Landmark District 6 Blocks, 84 Parcels 1990 Industrial and warehouse of brick and reinforced concrete single- and multi-story warehouses erected between 1906 and 1929. 9 Bush Street Cottage Row Landmark District 2 Blocks, 23 Parcels 1991 Residential buildings of flat front Italianate and Stick design in Japantown. 10 Civic Center Landmark District 15 Blocks, 61 Parcels 1996 Monumental Beaux Arts Classical design institutional buildings flanking a central open space. 11 Dogpatch Landmark District 9 Blocks, 131 Parcels 2003 Oldest enclave of industrial workers’ housing in San Francisco located east of Potrero Hill. 12 Market Street Masonry Landmark District 5 Blocks, 8 parcels 2013 Discontiguous district of 8 structures built between 1911-1925. Each building is constructed of reinforced concrete or a combination of brick and reinforced concrete. All are designed by San Francisco master architects. 13 Duboce Park Landmark District 4 Blocks, 90 Parcels 2013 Residential district featuring well-preserved Victorian- and Edwardian-era homes, many in the Queen Anne style. The district includes Duboce Park. ^ "Appendix A to Article 10: List of designated landmarks". San Francisco Planning Code. American Legal Publishing Corporation. Retrieved 7 January 2014. ^ "City of San Francisco Designated Landmarks". City of San Francisco. ^ Numbers are as designated in the San Francisco Municipal Ordinance. Blue colors represent higher designations as National Historic Landmarks and listing on the National Register of Historic Places; yellow represents sites that are San Francisco Designated Landmarks without a higher designation. No color represents delisted monuments. ^ "San Francisco Landmark 3: Bank of California:". NoeHill. 2010. Retrieved 2010-04-15. ^ "San Francisco Landmark 7: Audiffred Building". NoeHill. 2010. Retrieved 2010-04-15. ^ "San Francisco Landmark 8: Bayview Opera House". NoeHill. 2010. Retrieved 2010-04-15. ^ "San Francisco Landmark 33: Sentinel Building". NoeHill. 2010. Retrieved 2010-04-21. ^ "San Francisco Landmark 47: Nightingale House". NoeHill. 2010. Retrieved 2010-04-15. ^ "San Francisco Landmark 191: Southern Pacific Hospital:". NoeHill. 2014. Retrieved 2014-05-13. 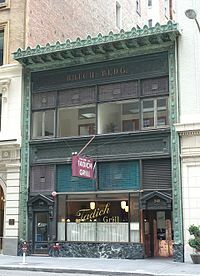 ^ "San Francisco Landmark 223: Carmel Fallon Building". NoeHill. 2010. Retrieved 2010-04-15. ^ "Sam Jordan's Bar Landmark Designation Report" (PDF). San Francisco Planning Department. Retrieved 7 January 2014. ^ "Twin Peaks Tavern Landmark Designation Report" (PDF). San Francisco Planning Department. Retrieved 7 January 2014. ^ "Doelger Building Landmark Designation Report" (PDF). San Francisco Planning Department. Retrieved 7 January 2014. ^ "Marcus Books / Jimbo's Bop City Landmark Designation Report" (PDF). San Francisco Planning Department. Retrieved 8 June 2015. ^ "Swedish American Hall Designation Report" (PDF). San Francisco Planning Department. Retrieved 8 June 2015. ^ "182-198 Gough Street Designation Report" (PDF). San Francisco Planning Department. Retrieved 8 June 2015. ^ "University Mound Landmark Designation Report" (PDF). ^ "Cowell House Landmark Designation Report" (PDF). ^ "Bourdette Building Landmark Designation Report" (PDF). ^ "Alemany Emergency Hospital and Health Building Landmark Designation Report" (PDF). ^ "Planning Code - Landmark designation of 1345 Ocean Avenue (aka Ingleside Presbyterian Church and the Great Cloud of Witnesses)" (PDF). ^ "San Francisco Landmark Districts" (PDF). Retrieved 6 May 2013. ^ "Market Street Masonry Discontiguous Landmark District Designation Report" (PDF). San Francisco Planning Department. San Francisco Planning Department. September 19, 2012. Retrieved October 9, 2015. ^ "Duboce Park Landmark District". Wikimedia Commons has media related to San Francisco Designated Landmarks. This page was last edited on 24 April 2019, at 05:43 (UTC).